The Charlton Champion spent a very enjoyable morning last Saturday finding out about the work that Champions 4 Change (C4C) is doing with young people at St. Thomas’ Church in Woodland Terrace. An offshoot of St. Peter’s ABC, an amateur boxing club that’s been in the area since the early 1900s, Champions 4 Change “uses boxing, fitness and mentoring as a vehicle for positive change in young people”. 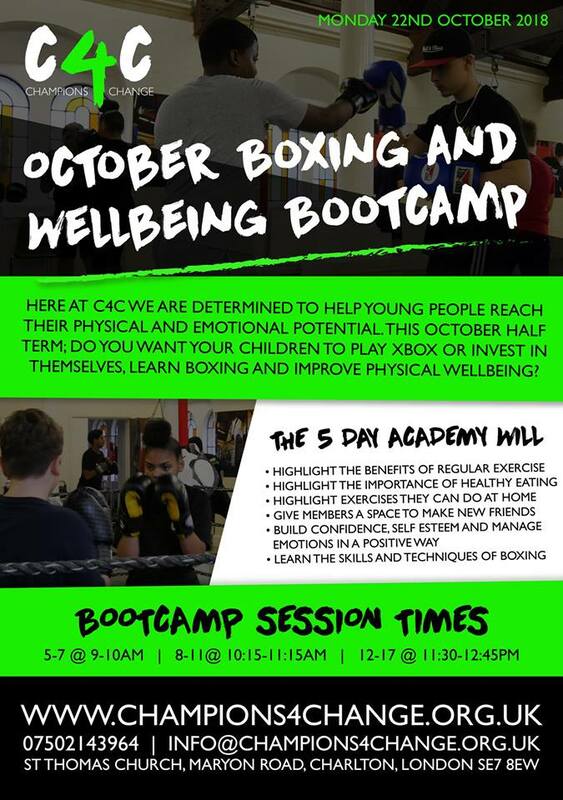 Led by director Scott O’Connor, the team run a number of programmes designed to develop fitness and mental wellbeing through boxing, for children and older people – including programmes focussed on young carers. Older children work their way through the ASDAN GB Boxing Awards programmes, gaining recognised qualifications as they go, and can then go on to help train other children and adults as they progress, gaining further experience and confidence as part of the process. 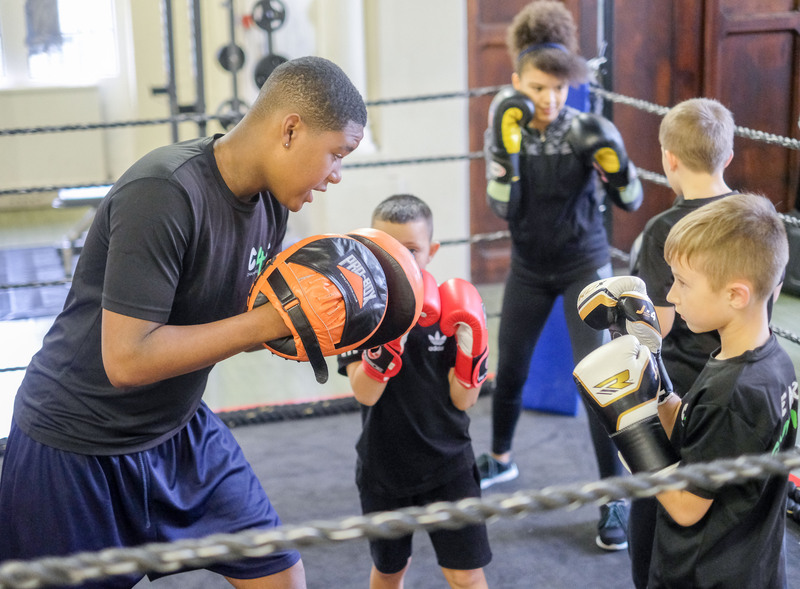 C4C works closely with St Peter’s, signposting young people into the club once they have reached a certain level, or if they wish, to take their boxing to the next level and do it competitively. As well as running programmes in schools, Champions 4 Change also runs one-to-one personal training sessions. Also visiting on Saturday was Matthew Pennycook, MP for Greenwich and Woolwich, who took a boxing lesson from C4C director Scott O’Connor. One of the club’s regulars, Helen Jakeways, who kindly introduced us to C4C, says, “I’ve been going to the over-40s sessions for four months now and thoroughly enjoy the friendly atmosphere and exercise provided by Scott and volunteer coaches Jack and George. “I only go once a week but there has definitely been an improvement in my overall levels of fitness and strength. I’ve also had a couple of enjoyable one-to-one sessions with Scott which really helped with my boxing technique. Scott and his team carefully manage activity to suit different needs and there is no pressure to work beyond what you feel comfortable doing. “It’s good fun (and great exercise) to work with the team on the pads and they all have a sense of humour, which is a must when you’re facing shots from beginners. This writer enjoyed his visit to the Saturday morning session so much that he went back on Tuesday to try a taster of the over-40s programme (6.15-7pm, Tuesdays) – and has promised to return! I’d recommend it for anyone looking to get fit in a friendly, supportive environment. Champions 4 Change on Facebook. CharltonBoxing, Champions4Change, Childrens activities, ST Thomas Church. Next Article How was 2018’s Horn Fair at Charlton House?